Overlooked is our potential to enhance the performance of the biosphere in capturing CO2 and greening the land. The soil itself is second only to the oceans, and the plant biomass is an additional sink for CO2. Below is an overview of the win-win proposition for humans to sequester carbon in the soil and restore its health and productivity at the same time. H/T Mark Krebs for suggesting this topic and providing resources from his own research and teaching. Global Sequestration Potential of Increased Organic Carbon in Cropland Soil by Robert J. Zomer, Deborah A. Bossio, Rolf Sommer & Louis V. Verchot 2017. Excerpts in italics with my bolds and titles. The role of soil organic carbon in global carbon cycles is receiving increasing attention both as a potentially large and uncertain source of CO2 emissions in response to predicted global temperature rises, and as a natural sink for carbon able to reduce atmospheric CO2. There is general agreement that the technical potential for sequestration of carbon in soil is significant, and some consensus on the magnitude of that potential. Croplands worldwide could sequester between 0.90 and 1.85 Pg C/yr, i.e. 26–53% of the target of the “4p1000 Initiative: Soils for Food Security and Climate”. The importance of intensively cultivated regions such as North America, Europe, India and intensively cultivated areas in Africa, such as Ethiopia, is highlighted. Soil carbon sequestration and the conservation of existing soil carbon stocks, given its multiple benefits including improved food production, is an important mitigation pathway to achieve the less than 2 °C global target of the Paris Climate Agreement. Soils, however, can act as both sources and sinks of carbon, depending upon management, biomass input levels, micro-climatic conditions, and bioclimatic change. Substantially more carbon is stored in the world’s soils than is present in the atmosphere. The global soil carbon (C) pool to one-meter depth, estimated at 2500 Pg C, of which about 1500 Pg C is soil organic carbon (SOC), is about 3.2 times the size of the atmospheric pool and 4 times that of the biotic pool. An extensive body of research has shown that land management practices can increase soil carbon stocks on agricultural lands with practices including addition of organic manures, cover cropping, mulching, conservation tillage, fertility management, agroforestry, and rotational grazing. There is general agreement that the technical potential for sequestration of carbon in soil is significant, and some consensus on the magnitude of that potential13. On this basis, the 4p1000 initiative on Soil for Food Security and Climate, officially launched by the French Ministry of Agriculture at the United Nations Framework Convention for Climate Change: Conference of the Parties (UNFCCC COP 21) in Paris, aims to sequester approximately 3.5Gt C annually in soils. Croplands will be extremely important in this effort, as these lands are already being actively managed, and so amenable to implementation of improved practices. Furthermore, because almost all cropped soils have lost a large percentage of their pre-cultivation SOC, they potentially represent a large sink to re-absorb carbon through the introduction and adoption of improved or proper management aimed towards increased SOC. However, carbon is rarely stored in soils in its elemental form, but rather in the form of organic matter which contains significant amounts of other nutrients, above all nitrogen. Nutrients, biomass productivity, the type of vegetation and water availability, among other constraints therefore can be major limiting factors inhibiting increases in soil carbon sequestration. Further imperative to sequester carbon in soils arises from the multiple co-benefits that are obtained from sequestration of carbon in soils that have been depleted of their organic matter. 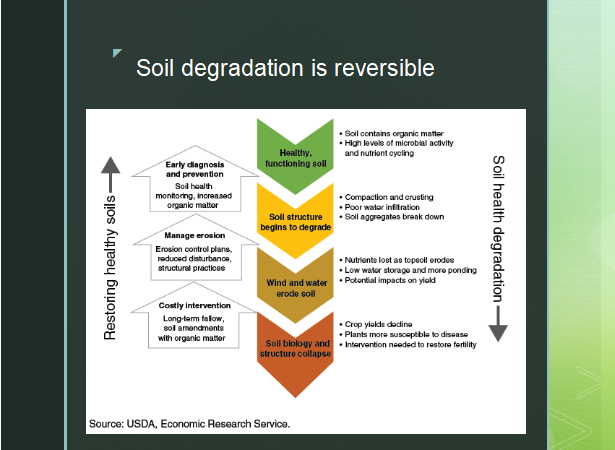 Soil fertility, health, and functioning are immediate consequences of the amount of soil organic matter (and hence carbon) a soil contains; this is even more important for highly weathered soils, as is the case for the majority of soils in the humid lowland tropics. Increasing carbon in soils also means improving its physical properties and related ecosystems services, such as better water infiltration, water holding capacity, as well as potentially increasing agricultural productivity and ecological resilience. An implicit basic assumption is that in general, 50 to 70% of soil carbon stocks have been lost in cultivated soils, such that the SOC (Soil Organic Carbon) status of almost all cultivated soils can be increased. It is expected that these cropped soils will be able to sequester carbon for at least 20 years before reaching saturation points and new SOC equilibriums, while meta-analysis of field studies suggests that in some instances significant sequestration can continue for 30 or even up to 40 years before reaching new equilibriums. The regions of North America, Eurasia (Russia) and Europe currently store the greatest amount of carbon on cropland, each with more than 21 Pg C, and all together accounting for over 50% of all SOC stocks on cropland globally. By contrast, Central America, North Africa, and the Australian/Pacific region have very low amounts of stored SOC, together comprising 6.48 Pg C or just over 4.6% of the global total. Western Asia, South Asia, Southeast East Asia and East Asia each have moderate amount ranging from 4.38 Pg C to 9.14 Pg C, but together accounting for just less than 2% of global total. On these croplands adoption of improved management practices offers the opportunity to sequester significant amounts of carbon in the near term, and potentially to make an important contribution to global mitigation efforts. The 4p1000 Initiative has identified an aspirational sequestration target of 3.5 Pg C/yr to provide substantive global mitigation. Our estimates suggest that from 26% up to 53% (0.90–1.85 Pg C) of this target could be reached in the top 30 cm of cropland soils alone, and continue over at least 20 years after adoption of SOC enhancing management, such as incorporation of organic manures, cover cropping, mulching, conservation tillage, some types for agroforestry practices, rotational grazing, or other practices known to increase soil carbon at the decadal scale. Given the large amount of cropland potentially available, sequestering carbon via increases in the soil component on agricultural land is an achievable and potentially effective route to quickly increasing CO2 sequestration in the near term. For comparison, above-ground losses due to tropical land use conversion are currently estimated at 0.6–1.2 Pg C yr-1. A strategy of enhancing agriculture with soil carbon enriching improved practices, e.g. via appropriate policy mechanisms, thus offers significant potential to mitigate land use related carbon emissions and provide an opportunity for agricultural production to positively contribute to global mitigation efforts. SOC may be either enhanced by, or enhance above- and below-ground biomass carbon on agricultural land, allowing for synergistic increases in on-farm carbon stocks. Agroforestry systems and planting trees, for example, may increase soil carbon sequestration. The benefits of increasing soil organic matter in croplands goes far beyond climate change mitigation potential. Facilitation of increased SOC through improved farming and soil conservation practices, enhancing resilience through improved fertility status and water holding capacity, also provide important adaptation benefits. It is generally recognized that changes in the moisture regime (e.g. drought or heavy precipitation events) can significantly impact crop productivity. These climatic conditions are mitigated by SOC, which adds structure, improves water infiltration and holding capacity, increases cation exchange capacity, and impacts soil fertility, a major controlling factor of agricultural productivity and both regional and household food security. Soil conditions have dramatic effects on the abundance and efficiency of N-fixing bacteria, which are vitally important in cropping systems that lack fertilizer inputs. Thus increased SOC through improved management practices is likely to add substantial resilience to croplands and farming systems, particularly during drought years or increased seasonal variability, helping to avoid edaphic (soil related) droughts that result from land degradation. For the most part, agricultural practices that increase soil organic matter are supportive of enhanced food production and other ecosystem services. This is in contrast to other proposed negative emission strategies, such as afforestation (plantations of fast growing trees) and BECCS (bioenergy and carbon capture and storage) that will entail destruction of huge amounts of natural ecosystems or productive agriculture land if implemented at scales large enough to impact CO2 in the atmosphere. Given that hundreds of millions of small farmers for their subsistence depend upon croplands around the world, mitigation benefits of enhanced SOC storage must be recognized as only one significant component of an array of multiple benefits to achieve. Despite the large technical potential to sequester carbon in soils, there are often significant limitations to achieving that potential in any particular place and within specific farming systems, including lack of biomass and other inputs. In addition, there may be tradeoffs with productivity, food security or hydrologic balances, as well as concerns regarding other GHGs, such as N2O. As with any efforts to sustain notable changes in practice significant understanding of cultural, political and socioeconomic contexts are required. Numerous studies are referenced at the NIPCC chapter on CO2, Plants and Soils. While our knowledge of the biosphere CO2 sink is incomplete, much is known to scientists and the information points not to alarm but to opportunity. The surplus CO2 from burning fossil fuels represents an occasion for us to assist nature to replenish soiils depleted of the carbon content plants need to achieve their potential. Excerpts in italics with my bolds. Assist Forests to benefit even more from rising CO2. Forests contain perennial trees that remove CO2 from the atmosphere during the process of photosynthesis and store its carbon within their woody tissues for decades to periods of sometimes more than a thousand years. It is important to understand how increases in the air’s CO2 content affect forest productivity and carbon sequestration, which has a great impact on the rate of rise of the air’s CO2 concentration. Where tropical forests have not been decimated by the targeted and direct destructive actions of human society, such as the felling and burning of trees, forest productivity has been growing ever greater with the passing of time, rising with the increasing CO2 content of the air. This has occurred despite all concomitant changes in atmospheric, soil, and water chemistry, including twentieth century global warming, which IPCC claims to have been unprecedented over the past one to two millennia. The planet is greener with the rise in CO2. Forest growth rates throughout the world have gradually accelerated over the years in concert with, and in response to, the historical increase in the air’s CO2 concentration. As the atmosphere’s CO2 concentration rises, forests likely will respond by exhibiting significant increases in biomass production, and thus likely will grow much more robustly and significantly expand their ranges, as is already being documented in many parts of the world. What has put the planet’s trees on this healthier trajectory of being able to sequester significant amounts of carbon in their old age, when past theory (based on past observations) decreed they should be in a state of no-net-growth or even negative growth? The answer is rather simple. For any tree of age 250 years or more, the greater portion of its life (at least two-thirds of it) was spent in an atmosphere of much reduced CO2 content. As the CO2 content of the air increases, nearly all plants, including those of various forest ecosystems, respond by increasing their photosynthetic rates and producing more biomass. These phenomena allow long-lived perennial species characteristic of forest ecosystems to sequester large amounts of carbon within their trunks and branches aboveground and their roots below ground for extended periods of time. These processes, in turn, significantly counterbalance CO2 emissions produced by mankind’s use of fossil fuels. Elevated CO2 enhances photosynthetic rates and biomass production in forest trees, and both of these phenomena lead to greater amounts of carbon sequestration. Elevated CO2 also enhances carbon sequestration by reducing carbon losses arising from plant respiration and in some cases from decomposition. Thus, as the air’s CO2 content rises, the ability of forests to sequester carbon rises along with it, appropriately tempering the rate of rise of the air’s CO2 content. It would appear the ongoing rise in the air’s CO2 content will not materially alter the rate of decomposition of the world’s soil organic matter. This means the rate at which carbon is sequestered in forest soils should continue to increase as the productivity of Earth’s plants is increased by the aerial fertilization effect of the rising atmospheric CO2 concentration. “The accumulation of refractory organic carbon in soils that developed after the deglaciation of the American Pacific Northwest is ongoing and may still be far from equilibrium with mineralization and erosion rates.” This further suggests, in their words, “the turnover time of this carbon pool is 10,000 to 100,000 years or more and not 1,000 to 10,000 years as is often used in soil carbon models.” Smittenberg et al. Most of Earth’s terrestrial plant life evolved around 500 to 400 million years ago, when the katmospheric CO2 concentration was possibly 10 to 20 times higher than it is today. As a consequence, the biochemical pathways and enzymes involved in carbon fixation should be better adapted to significantly higher-than-present atmospheric CO2 levels, which has in fact been demonstrated to be the case. As the atmosphere’s CO2 content has dropped from that early point in time, it has caused most of Earth’s vegetation to become less efficient at extracting carbon dioxide from the air. However, the recent ongoing rise in atmospheric CO2 concentration is gradually increasing photosynthetic rates and stimulating vegetative productivity and the terrestrial sequestration of carbon around the globe. Restore barren land to natural or managed productivity. Nearly all of Earth’s plant life responds favorably to increases in the air’s CO2 content by exhibiting enhanced rates of photosynthesis and biomass production. Consequently, these phenomena tend to increase soil carbon contents by increasing root exudation of organic compounds and the amount of plant litter returned to the soil. Thus, it can be expected that CO2-mediated increases in soil carbon content will affect soil bacterial communities. The end result of all these phenomena working together is greater carbon storage, both above- and below-ground, in what was previously little more than a source of dust for the rest of the world. And therein lies one of the great unanticipated benefits of the CO2-induced greening of the globe’s deserts: less airborne dust to spread havoc across Earth. “It’s possible to rehabilitate large-scale damaged ecosystems.” Environmental film maker John D. Liu documents large-scale ecosystem restoration projects in China, Africa, South America and the Middle East, highlighting the enormous benefits for people and planet of undertaking these efforts globally. Educate and enable gardeners and farmers to apply practices that sequester CO2 and enhance soil health and productivity. 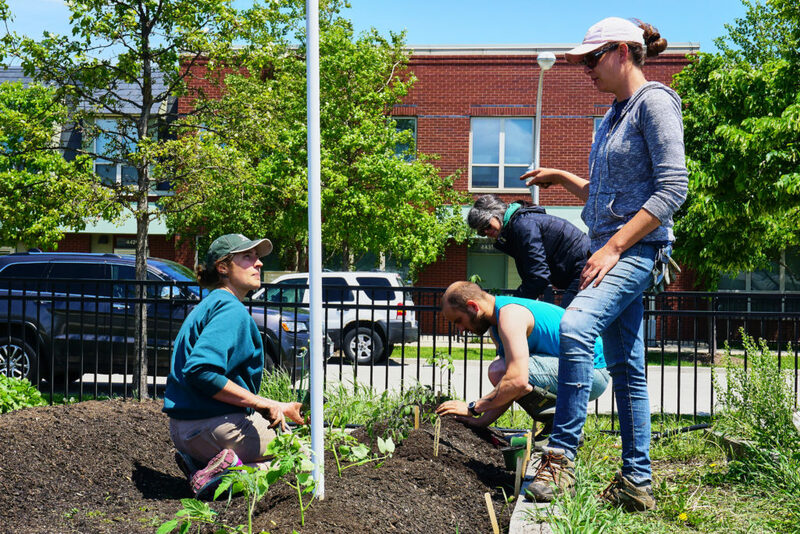 Various programs and initiatives are underway promoting land management practices that improve soil health by enhancing its storage of carbon. 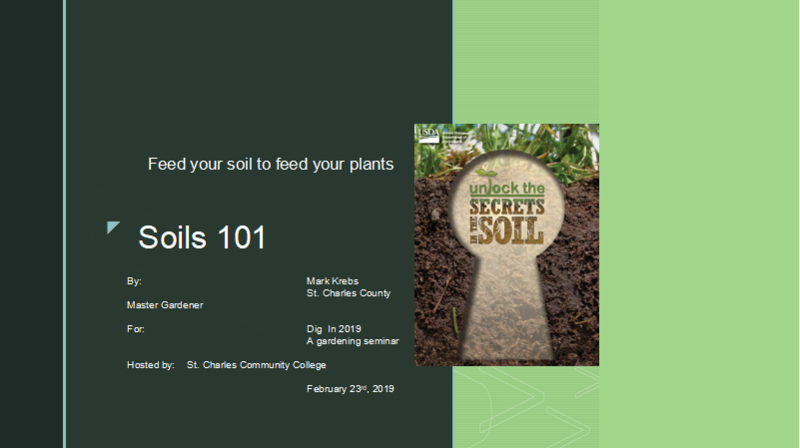 One example comes from Mark Krebs, master gardener, who conducts seminars encouraging people to apply these principles to plots of land on their property or publicly available for such care. They educate the public on how soil is degraded and how it can be regenerated. Rather than protesting the use of fossil fuels essential to modern life and to social and economic development in our age, people who want to make a difference should get down in the dirt. The soil is starved for carbon and it is more and more available in the air. Nature is already accessing this renewed source of CO2, We humans should claim this unique opportunity to help the land regenerate and recover its productivity.